"We were able to identify interactions between microbiota that were not previously observed, and we think that some of those interactions may actually help prevent the onset of severe diarrhea," says O. Colin Stine, a professor of epidemiology and public health at the University of Maryland School of Medicine. 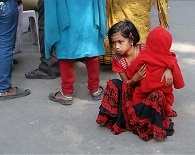 The researchers used a technique called high-throughput 16S rRNA genomic sequencing to examine both "good" and "bad" microbiota -- the tens of trillions of microbes that inhabit the human intestinal system -- in samples taken from 992 children in Bangladesh, The Gambia, Kenya and Mali under the age of 5 who were suffering from MSD. "New technologies have opened up new windows of discovery, so they asked us to look at the samples," says Pop, who adds that he and Stine expect to conduct further genomic and epidemiological studies to assess the potential development of diet- or microbiological-based therapeutics. The longstanding scientific collaboration between the two researchers is enhanced by the MPowering the State strategic partnership, launched in 2011 to support collaborative research and education between the state's top two public research institutions, the University of Maryland, College Park and the University of Maryland, Baltimore.